Every week, at every Premiership rugby club, players are using cannabis oil products. 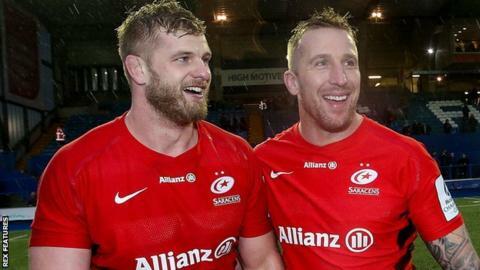 At Saracens, England international George Kruis and his Wales club-mate Dominic Day take cannabis oils, capsules and balms which they say help "put our bodies back together". In fact, they believe so strongly in the recovery effects of cannabidiol (CBD) they have started their own business selling it. But what are the rules? What do the rugby authorities say? And are players getting high? It is the tetrahydrocannabinol (THC) in cannabis that gets people high and has been linked to an increased risk of mental health issues and other side effects. But another component is cannabidiol (CDB) - which the World Health Organization (WHO) says causes no harm and does not appear to have abuse potential. The World Anti-Doping Authority (Wada) - which governs rugby's anti-doping policy - removed CBD from its banned list in January. Cannabis is an illegal class B drug in the UK but CBD on its own is legal. Chronic pain, popping pills and better sleep. "I was probably taking prescription anti-inflammatories and painkillers four or five times a week just to get to the weekend to play," says Day. "It wasn't where I wanted to be at all. I just don't take that stuff now, I stick with the CBD oil." Kruis and Day are on a recovery day at Saracens training base after a gruelling session for the Premiership champions to start the week. This week, they have also become business partners, launching a company selling cannabis oil products. Asked whether these products mean rugby players are getting high, Kruis replies: "No, definitely not. The stigma attached to cannabis is due to a lack of knowledge about it." Day explains: "In the products we use and make, there's nowhere near enough THC to feel any effects of it." But how did Day and Kruis discover CBD? And what prompted them to use it in the first place? "I started taking it after I had knee surgery," says Day. "I was looking for every way to help myself get better. "I was doing the normal icing and stretching, and then one day I came across CBD online and everyone was talking about the benefits. "Initially I tried vaping but that wasn't really what I wanted to do, so I switched to the oils. Even my physio noticed the difference and he didn't know I was taking it at the time. "The first thing I noticed was my sleep was amazing. The inflammation in my knee also went down and it relieved the pain. I was sold from then on." And it was a similar story for Kruis. The 28-year-old required ankle surgery shortly after Day and also began using cannabis oil after speaking to his team-mate. "Sleep was definitely one of the things it helped with for me," he says. "But I also have low-level chronic pain and I was able to reduce the amount of painkillers I was taking." Kruis and Day are using CBD products legally. But how does that fit with professional rugby and anti-doping rules? "I'm more than happy to take CBD during the season," adds Kruis. "I know the rules and the boundaries around it. "The easiest way of putting it is it's completely legal in the UK and it's approved by Wada. These are giving it the green light because they can see something in it. "We've talked about what we're doing off the field. Coaches are always interested in what you're doing and we've kept Saracens in the loop through the whole process. "We've spoken to the anti-doping team at the Rugby Football Union and the Rugby Players' Association. They're behind us." But for Day, talks with the Welsh Rugby Union (WRU) have been less clear. BBC Sport has approached the WRU for comment. "The WRU sent out a blanket email to all players warning that some cannabinoids are banned and will produce a positive drugs test. "It wasn't as clear as 'CBD is fine to take', so I think we need to instil knowledge in coaches and the unions. There's obviously still a stigma around cannabis and we want to educate people about it." So have the pair faced much opposition to their new-found association with cannabis? "We've found people are actually really interested in it," says Kruis. "There's a definite lack of knowledge but they're not against it. If anything people are intrigued to find out more. "There are four or five people in every club who are taking it - so it's about creating a product everyone is happy to take and governing bodies are also happy with." And will CBD be used at the 2019 World Cup in Japan in September? "You never know," says Kruis. Get more information on these BBC Advice pages.